Are you looking for Balloons or Balloon Decorations in Largo, Clearwater, Seminole, Pinellas Park, Tampa, Clearwater Beach, Bellaire Bluffs, Pinellas County, Pinellas, St Petersburg, St Petersburg, Safety Harbor, Oldsmar, Pasco County, Pasco, Port Richey, New Port Richey, Hudson, Tarpon Springs? Then you have found what you have been looking for! Tampa Bay Party and Balloon can supply a wide range of balloon products ranging from small I home events to large convention halls wedding, corporate and political events. Table centerpieces, Arches and balloon drops We bring the Balloon shop to your location. Never again will you be one arrangement short, or have to figure how to get 12 dozen table centerpieces in your car. If you need one more we just make it right there at your event. 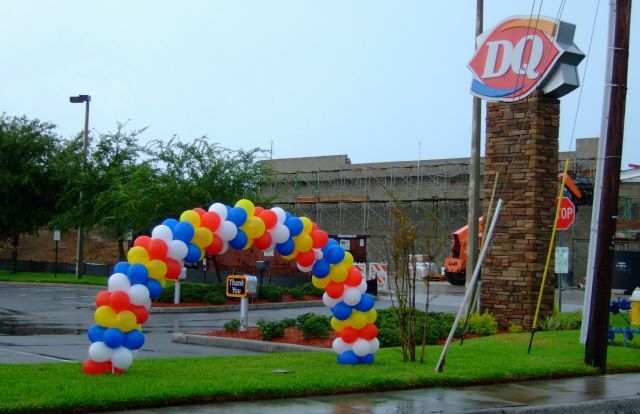 We offer Balloon Arches make of either latex and Mylar Balloons Prices range from $99.00 for a Latex balloon arch in a wide range of colors to $169.00 using Foil Mylar balloons. Contact us for more details. We Offer Balloon Drops and balloon Releases, fron several dozan balloons to the 1000's. Contact us for more details and quote.